Rice is one of the most important crops for food security in sub-Saharan Africa (SSA). There exists, however, a widening gap between its regional demand and supply. Competition from weeds is typically one of the major biophysical constraints in upland rice, frequently leading to significant yield losses and sometimes to complete crop failure, thereby threatening the food security of subsistence farmers. However, weed management practices that are currently employed to avoid such losses are associated with high weeding labor demands. 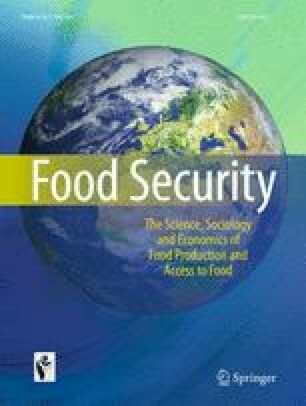 This study examined the relationships between weeding times per farm, average time per hectare per weeding and rice yields of upland rice farmers in SSA, with the objective of estimating the impact of weeds on rural households’ economies in SSA reliant on upland rice production systems. To this end, we analyzed survey data collected from 992 farmers in four countries (Cameroon, Democratic Republic of Congo, Togo and Uganda). The counterfactual outcomes framework of modern evaluation theory was used to estimate the Average Treatment Effect (ATE) of the number of times a farm is weeded on weeding labor efficiency, as measured by the average number of hours spent per hectare at each weeding, and on crop productivity expressed as rice grain yield per hectare. A single weeding required 173 h per hectare, while weeding twice required 130 h per hectare per weeding (259 h per hectare in total) and weeding three times required 125 h per hectare per weeding (376 h per hectare in total). Correspondingly, a single weeding was associated with an average rice yield of 1.2 t ha−1, weeding twice yielded 1.7 t ha−1 and weeding three times yielded 2.2 t ha−1. Compared to the situation where the farm is weeded only once and controlling for other factors, the model estimated yield gains of a second weeding to be 0.33 t ha−1 and a third weeding to result in a gain of 0.51 t ha−1. The estimated labor gains were respectively 64.2 and 68.1 h per hectare per weeding for a second and a third weeding. We conclude that weeding an upland rice crop more than once in SSA increases weeding labor efficiency by about 37 % and rice productivity by more than 27 %. Rather than motivating farmers to increase their labor inputs for manual weeding, however, we propose that more research and development funds should be devoted to developing, testing and promoting locally adapted strategies of labor-saving weed management in rice in sub-Saharan Africa. This will result in a significant contribution to regional food security and poverty alleviation. This is an output of the Japan-funded ‘Emergency Rice Project: Rice Data Systems for sub-Saharan Africa’ and the EU-IFAD-funded project entitled ‘2010 Incremental EC Contribution to CGIAR: Rice Policy and Technology Impact on Food Security and Poverty Reduction in Sub-Saharan Africa’ (Grant No. C-ECG-40-WARDA). We are grateful to the People of Japan and the European Union for supporting this study and the National Agricultural Research Systems (NARS) and the National Agricultural Statistical Services of Cameroon, Democratic Republic of Congo, Togo and Uganda for their collaboration in data collection. We especially thank Dorothy Malaa Kenyi and Pierre Nzodjo from Cameroon, Abang Olivier Kinzamba and Robert Ngonde Nsakala from DRC, Tsatsu K. Domenyo and Ezi Tsogli from Togo, Stella Adur, Bernard Odur and Mary Frances Nakakawa from Uganda and all the AfricaRice staff involved in collection and management of the data.